Definition at line 200 of file rpcndr.h. Definition at line 223 of file rpcndr.h. Referenced by array_buffer_size(), array_compute_and_size_conformance(), array_compute_and_write_conformance(), array_free(), array_memory_size(), array_read_variance_and_unmarshall(), array_write_variance_and_marshall(), ComputeVariance(), EmbeddedPointerBufferSize(), EmbeddedPointerFree(), EmbeddedPointerMarshall(), EmbeddedPointerMemorySize(), EmbeddedPointerUnmarshall(), NdrComplexArrayBufferSize(), NdrComplexArrayFree(), NdrComplexArrayMarshall(), NdrComplexStructBufferSize(), NdrComplexStructMarshall(), NdrComplexStructMemorySize(), NdrComplexStructUnmarshall(), NdrNonConformantStringBufferSize(), NdrNonConformantStringMarshall(), NdrNonConformantStringMemorySize(), NdrNonConformantStringUnmarshall(), NdrVaryingArrayBufferSize(), NdrVaryingArrayFree(), NdrVaryingArrayMarshall(), NdrVaryingArrayMemorySize(), NdrVaryingArrayUnmarshall(), ReadVariance(), and WriteVariance(). Definition at line 203 of file rpcndr.h. Referenced by array_memory_size(), array_read_variance_and_unmarshall(), array_write_variance_and_marshall(), ComplexMarshall(), ComplexStructMemorySize(), ComplexUnmarshall(), CtxClose(), CtxHello(), CtxOpen(), determine_pointer_marshalling_style(), EmbeddedPointerMarshall(), EmbeddedPointerMemorySize(), EmbeddedPointerUnmarshall(), es_data_alloc(), es_data_read(), hello_CtxClose(), hello_CtxHello(), hello_CtxOpen(), init_user_marshal_cb(), m_CtxClose(), m_CtxHello(), m_CtxOpen(), m_CtxOpen2(), mes_proc_header_marshal(), mes_proc_header_unmarshal(), ndr_async_client_call(), ndr_client_call(), NdrBaseTypeMarshall(), NdrBaseTypeMemorySize(), NdrBaseTypeUnmarshall(), NdrClientContextMarshall(), NdrClientContextUnmarshall(), NdrComplexArrayMarshall(), NdrComplexArrayUnmarshall(), NdrComplexStructMarshall(), NdrComplexStructMemorySize(), NdrComplexStructUnmarshall(), NdrConformantStructFree(), NdrConformantStructMarshall(), NdrConformantStructUnmarshall(), NdrConformantVaryingStructMarshall(), NdrConformantVaryingStructMemorySize(), NdrConformantVaryingStructUnmarshall(), NdrEncapsulatedUnionMarshall(), NdrEncapsulatedUnionMemorySize(), NdrEncapsulatedUnionUnmarshall(), NdrFixedArrayMarshall(), NdrFixedArrayMemorySize(), NdrFixedArrayUnmarshall(), NdrGetBuffer(), NdrGetUserMarshalInfo(), NdrInterfacePointerMarshall(), NdrInterfacePointerMemorySize(), NdrInterfacePointerUnmarshall(), NdrpCompleteAsyncClientCall(), NdrPointerMarshall(), NdrPointerMemorySize(), NdrPointerUnmarshall(), NdrProxyGetBuffer(), NdrProxySendReceive(), NdrSendReceive(), NdrServerContextMarshall(), NdrServerContextNewMarshall(), NdrServerContextNewUnmarshall(), NdrServerContextUnmarshall(), NdrServerInitializeNew(), NdrSimpleStructMarshall(), NdrSimpleStructMemorySize(), NdrSimpleStructUnmarshall(), NdrSimpleTypeUnmarshall(), NdrStubCall2(), NdrStubGetBuffer(), NdrUserMarshalMarshall(), NdrUserMarshalMemorySize(), NdrUserMarshalUnmarshall(), NdrVaryingArrayMarshall(), NdrVaryingArrayMemorySize(), NdrVaryingArrayUnmarshall(), ReadConformance(), ReadVariance(), RpcStream_Create(), safe_buffer_increment(), safe_copy_from_buffer(), safe_copy_to_buffer(), test_client_init(), test_conf_complex_array(), test_conf_complex_struct(), test_conformant_array(), test_conformant_string(), test_iface_ptr(), test_marshal_VARIANT(), test_ndr_buffer(), test_ndr_simple_type(), test_NdrGetUserMarshalInfo(), test_nonconformant_string(), test_nontrivial_pointer_types(), test_pointer_marshal(), test_server_init(), test_simple_struct_marshal(), test_struct_align(), union_arm_marshall(), union_arm_memory_size(), union_arm_unmarshall(), unmarshall_discriminant(), validate_string_data(), WriteConformance(), and WriteVariance(). Definition at line 205 of file rpcndr.h. Referenced by es_data_read(), hello_CtxClose(), hello_CtxHello(), hello_CtxOpen(), m_CtxOpen(), NdrClientContextUnmarshall(), NdrClientInitializeNew(), NdrpCompleteAsyncClientCall(), NdrProxyGetBuffer(), NdrProxySendReceive(), NdrSendReceive(), NdrServerInitializeNew(), ReadConformance(), ReadVariance(), safe_copy_from_buffer(), test_client_init(), test_conf_complex_array(), test_conf_complex_struct(), test_conformant_array(), test_conformant_string(), test_iface_ptr(), test_marshal_VARIANT(), test_ndr_buffer(), test_NdrGetUserMarshalInfo(), test_nonconformant_string(), test_nontrivial_pointer_types(), test_pointer_marshal(), test_server_init(), test_simple_struct_marshal(), test_struct_align(), union_arm_unmarshall(), and validate_string_data(). Definition at line 207 of file rpcndr.h. Referenced by array_buffer_size(), ComplexBufferSize(), CtxClose(), CtxHello(), CtxOpen(), determine_pointer_marshalling_style(), EmbeddedPointerBufferSize(), es_data_read(), hello_CtxClose(), hello_CtxOpen(), m_CtxClose(), m_CtxHello(), m_CtxOpen(), m_CtxOpen2(), ndr_async_client_call(), ndr_client_call(), NdrBaseTypeBufferSize(), NdrClientContextMarshall(), NdrClientInitializeNew(), NdrComplexArrayBufferSize(), NdrComplexArrayMarshall(), NdrComplexStructBufferSize(), NdrComplexStructMarshall(), NdrConformantStructBufferSize(), NdrConformantVaryingStructBufferSize(), NdrContextHandleBufferSize(), NdrEncapsulatedUnionBufferSize(), NdrFixedArrayBufferSize(), NdrGetBuffer(), NdrInterfacePointerBufferSize(), NdrInterfacePointerMarshall(), NdrInterfacePointerUnmarshall(), NdrMesProcEncodeDecode(), NdrpCompleteAsyncClientCall(), NdrPointerBufferSize(), NdrProxyGetBuffer(), NdrProxySendReceive(), NdrSendReceive(), NdrServerContextMarshall(), NdrServerContextNewMarshall(), NdrServerContextNewUnmarshall(), NdrServerContextUnmarshall(), NdrServerInitializeNew(), NdrSimpleStructBufferSize(), NdrStubCall2(), NdrStubGetBuffer(), NdrUserMarshalBufferSize(), NdrVaryingArrayBufferSize(), safe_buffer_increment(), safe_buffer_length_increment(), safe_copy_to_buffer(), SizeConformance(), SizeVariance(), test_client_init(), test_conf_complex_array(), test_conf_complex_struct(), test_conformant_array(), test_conformant_string(), test_iface_ptr(), test_marshal_VARIANT(), test_ndr_buffer(), test_ndr_simple_type(), test_NdrGetUserMarshalInfo(), test_nonconformant_string(), test_nontrivial_pointer_types(), test_pointer_marshal(), test_server_init(), test_simple_struct_marshal(), test_struct_align(), union_arm_buffer_size(), union_arm_marshall(), WriteConformance(), and WriteVariance(). Definition at line 206 of file rpcndr.h. Referenced by array_memory_size(), array_read_variance_and_unmarshall(), array_write_variance_and_marshall(), EmbeddedPointerMarshall(), EmbeddedPointerMemorySize(), EmbeddedPointerUnmarshall(), NdrConformantStructFree(), NdrConformantStructMarshall(), NdrConformantStructUnmarshall(), NdrConformantVaryingStructMarshall(), NdrConformantVaryingStructUnmarshall(), NdrFixedArrayMarshall(), NdrFixedArrayMemorySize(), NdrFixedArrayUnmarshall(), NdrSimpleStructMarshall(), NdrSimpleStructUnmarshall(), NdrVaryingArrayMarshall(), and NdrVaryingArrayUnmarshall(). Definition at line 204 of file rpcndr.h. Referenced by determine_pointer_marshalling_style(), es_data_alloc(), es_data_read(), es_data_write(), m_CtxOpen(), NdrClientInitializeNew(), NdrpCompleteAsyncClientCall(), NdrProxyGetBuffer(), NdrProxySendReceive(), NdrSendReceive(), NdrServerInitializeNew(), PointerFree(), test_client_init(), test_conf_complex_array(), test_conf_complex_struct(), test_conformant_array(), test_conformant_string(), test_iface_ptr(), test_marshal_VARIANT(), test_ndr_buffer(), test_ndr_simple_type(), test_nonconformant_string(), test_nontrivial_pointer_types(), test_pointer_marshal(), test_server_init(), test_simple_struct_marshal(), and test_struct_align(). Definition at line 266 of file rpcndr.h. Definition at line 270 of file rpcndr.h. Definition at line 218 of file rpcndr.h. Referenced by ndr_async_client_call(), ndr_client_call(), NdrClientInitializeNew(), NdrCorrelationInitialize(), NdrServerInitializeNew(), NdrStubCall2(), SkipConformance(), test_client_init(), test_ndr_buffer(), test_NdrCorrelationInitialize(), and test_server_init(). Definition at line 249 of file rpcndr.h. 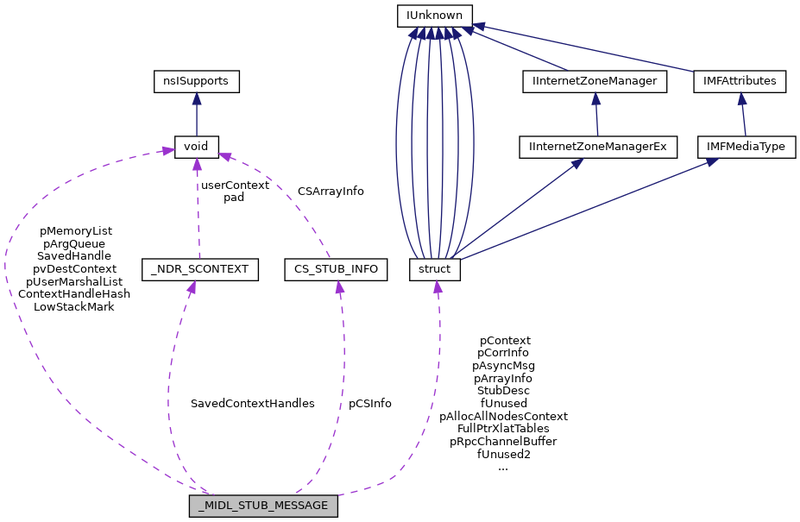 Referenced by NdrClientInitializeNew(), NdrInterfacePointerBufferSize(), NdrInterfacePointerMarshall(), NdrProxyInitialize(), NdrServerInitializeNew(), NdrStubInitialize(), test_common_stub_data(), test_NdrGetUserMarshalInfo(), and UserMarshalCB(). Definition at line 259 of file rpcndr.h. Referenced by NdrClientInitializeNew(), NdrProxyGetBuffer(), NdrProxySendReceive(), and NdrServerInitializeNew(). Definition at line 243 of file rpcndr.h. Referenced by NdrClientInitializeNew(), NdrFreeBuffer(), NdrGetBuffer(), NdrProxyFreeBuffer(), NdrProxyGetBuffer(), test_common_stub_data(), and test_ndr_buffer(). Definition at line 235 of file rpcndr.h. Referenced by NdrClientInitializeNew(), and NdrServerInitializeNew(). Definition at line 238 of file rpcndr.h. Definition at line 244 of file rpcndr.h. Definition at line 239 of file rpcndr.h. Referenced by NdrClientInitializeNew(), NdrCorrelationInitialize(), NdrpCompleteAsyncClientCall(), and NdrServerInitializeNew(). Definition at line 237 of file rpcndr.h. Referenced by NdrClientInitializeNew(), NdrServerInitializeNew(), and test_common_stub_data(). Definition at line 234 of file rpcndr.h. Definition at line 245 of file rpcndr.h. Definition at line 236 of file rpcndr.h. Definition at line 240 of file rpcndr.h. Referenced by marshal_STGMEDIUM(), marshal_WdtpInterfacePointer(), NdrClientInitializeNew(), NdrServerInitializeNew(), and test_common_stub_data(). Definition at line 242 of file rpcndr.h. Definition at line 241 of file rpcndr.h. Referenced by marshal_STGMEDIUM(), marshal_WdtpInterfacePointer(), NdrClientInitializeNew(), and NdrServerInitializeNew(). Definition at line 246 of file rpcndr.h. Definition at line 232 of file rpcndr.h. Definition at line 231 of file rpcndr.h. Referenced by ndr_async_client_call(), ndr_client_call(), NdrMesProcEncodeDecode(), NdrpCompleteAsyncClientCall(), NdrServerInitializeNew(), NdrStubCall2(), PointerBufferSize(), PointerFree(), PointerMarshall(), PointerMemorySize(), PointerUnmarshall(), test_client_init(), and test_server_init(). Definition at line 247 of file rpcndr.h. Definition at line 248 of file rpcndr.h. Definition at line 216 of file rpcndr.h. Referenced by ComplexBufferSize(), ComplexStructMemorySize(), EmbeddedPointerBufferSize(), EmbeddedPointerMemorySize(), NdrClientInitializeNew(), NdrComplexArrayBufferSize(), NdrComplexArrayMarshall(), NdrComplexArrayUnmarshall(), NdrComplexStructBufferSize(), NdrComplexStructMarshall(), NdrComplexStructUnmarshall(), NdrServerInitializeNew(), NdrUserMarshalBufferSize(), NdrUserMarshalMemorySize(), union_arm_buffer_size(), and union_arm_memory_size(). Definition at line 210 of file rpcndr.h. Referenced by array_read_variance_and_unmarshall(), init_MIDL_ES_MESSAGE(), marshal_STGMEDIUM(), marshal_WdtpInterfacePointer(), NdrClientInitializeNew(), NdrConformantStructUnmarshall(), NdrContextHandleMarshall(), NdrContextHandleUnmarshall(), NdrFixedArrayUnmarshall(), NdrInterfacePointerUnmarshall(), NdrPointerUnmarshall(), NdrServerInitializeNew(), NdrSimpleStructUnmarshall(), PointerUnmarshall(), test_client_init(), test_conf_complex_array(), test_conf_complex_struct(), test_conformant_array(), test_conformant_string(), test_iface_ptr(), test_nonconformant_string(), test_nontrivial_pointer_types(), test_pointer_marshal(), test_server_init(), test_simple_struct_marshal(), and test_struct_align(). Definition at line 260 of file rpcndr.h. Definition at line 221 of file rpcndr.h. Referenced by array_buffer_size(), array_compute_and_size_conformance(), array_compute_and_write_conformance(), array_free(), array_memory_size(), array_read_conformance(), array_read_variance_and_unmarshall(), array_write_variance_and_marshall(), calc_arg_size(), ComputeConformance(), ComputeConformanceOrVariance(), EmbeddedPointerBufferSize(), EmbeddedPointerFree(), EmbeddedPointerMarshall(), EmbeddedPointerMemorySize(), EmbeddedPointerUnmarshall(), get_ip_iid(), NdrComplexArrayBufferSize(), NdrComplexArrayFree(), NdrComplexArrayMarshall(), NdrComplexStructBufferSize(), NdrComplexStructMarshall(), NdrComplexStructMemorySize(), NdrComplexStructUnmarshall(), NdrConformantStructBufferSize(), NdrConformantStructMarshall(), NdrConformantStructUnmarshall(), NdrInterfacePointerMarshall(), NdrNonEncapsulatedUnionBufferSize(), NdrNonEncapsulatedUnionFree(), NdrNonEncapsulatedUnionMarshall(), ReadConformance(), ReadVariance(), and WriteConformance(). Definition at line 209 of file rpcndr.h. Referenced by ComputeConformanceOrVariance(), EmbeddedPointerBufferSize(), EmbeddedPointerFree(), EmbeddedPointerMarshall(), NdrComplexStructBufferSize(), NdrComplexStructFree(), NdrComplexStructMarshall(), NdrEncapsulatedUnionMemorySize(), and union_arm_memory_size(). Definition at line 208 of file rpcndr.h. Referenced by array_memory_size(), NdrBaseTypeMemorySize(), NdrComplexArrayMemorySize(), NdrComplexArrayUnmarshall(), NdrConformantArrayMemorySize(), NdrConformantStringMemorySize(), NdrConformantVaryingArrayMemorySize(), NdrConformantVaryingStructMemorySize(), NdrFixedArrayMemorySize(), NdrInterfacePointerMemorySize(), NdrNonConformantStringMemorySize(), NdrPointerMemorySize(), NdrSimpleStructMemorySize(), NdrUserMarshalMemorySize(), NdrVaryingArrayMemorySize(), PointerMemorySize(), test_conformant_array(), test_conformant_string(), test_nonconformant_string(), test_nontrivial_pointer_types(), test_pointer_marshal(), test_simple_struct_marshal(), and union_arm_memory_size(). Definition at line 222 of file rpcndr.h. Referenced by array_compute_and_write_conformance(), array_memory_size(), array_read_variance_and_unmarshall(), array_write_variance_and_marshall(), ComputeVariance(), NdrComplexArrayBufferSize(), NdrComplexArrayMarshall(), NdrComplexStructBufferSize(), NdrComplexStructMarshall(), NdrComplexStructMemorySize(), NdrComplexStructUnmarshall(), NdrConformantVaryingStructUnmarshall(), NdrNonConformantStringMarshall(), NdrNonConformantStringMemorySize(), NdrNonConformantStringUnmarshall(), NdrVaryingArrayBufferSize(), NdrVaryingArrayFree(), NdrVaryingArrayMarshall(), NdrVaryingArrayUnmarshall(), ReadVariance(), and WriteVariance(). Definition at line 211 of file rpcndr.h. Definition at line 214 of file rpcndr.h. Definition at line 252 of file rpcndr.h. Definition at line 258 of file rpcndr.h. Definition at line 254 of file rpcndr.h. Definition at line 261 of file rpcndr.h. Definition at line 269 of file rpcndr.h. Definition at line 262 of file rpcndr.h. Definition at line 263 of file rpcndr.h. Definition at line 265 of file rpcndr.h. Definition at line 264 of file rpcndr.h. Referenced by NdrAllocate(), NdrClientInitializeNew(), NdrServerInitializeNew(), test_common_stub_data(), and test_ndr_allocate(). Definition at line 217 of file rpcndr.h. Referenced by ComplexMarshall(), ComplexStructMemorySize(), ComplexUnmarshall(), EmbeddedPointerMarshall(), EmbeddedPointerMemorySize(), EmbeddedPointerUnmarshall(), NdrClientInitializeNew(), NdrComplexArrayMarshall(), NdrComplexArrayUnmarshall(), NdrComplexStructMarshall(), NdrComplexStructUnmarshall(), NdrServerInitializeNew(), NdrUserMarshalMarshall(), NdrUserMarshalUnmarshall(), union_arm_marshall(), and union_arm_unmarshall(). Definition at line 233 of file rpcndr.h. Referenced by ComplexBufferSize(), EmbeddedPointerBufferSize(), NdrClientInitializeNew(), NdrComplexArrayBufferSize(), NdrComplexStructBufferSize(), NdrServerInitializeNew(), NdrUserMarshalBufferSize(), test_common_stub_data(), and union_arm_buffer_size(). Definition at line 215 of file rpcndr.h. Definition at line 227 of file rpcndr.h. Definition at line 253 of file rpcndr.h. Referenced by NdrClientInitializeNew(), NdrGetUserMarshalInfo(), NdrProxyFreeBuffer(), NdrProxyGetBuffer(), NdrProxyInitialize(), NdrProxySendReceive(), NdrServerInitializeNew(), NdrStubInitialize(), and test_NdrGetUserMarshalInfo(). Definition at line 228 of file rpcndr.h. Definition at line 271 of file rpcndr.h. Definition at line 250 of file rpcndr.h. Referenced by NdrClientInitializeNew(), NdrInterfacePointerBufferSize(), NdrInterfacePointerMarshall(), NdrProxyInitialize(), NdrServerInitializeNew(), NdrStubInitialize(), and test_NdrGetUserMarshalInfo(). Definition at line 272 of file rpcndr.h. Definition at line 273 of file rpcndr.h. Definition at line 274 of file rpcndr.h. Definition at line 213 of file rpcndr.h. Referenced by NdrClientInitializeNew(), NdrServerInitializeNew(), test_client_init(), test_server_init(), and test_simple_struct_marshal(). Definition at line 202 of file rpcndr.h. Referenced by determine_pointer_marshalling_style(), es_data_alloc(), es_data_read(), init_user_marshal_cb(), m_CtxOpen(), ndr_async_client_call(), NdrClientContextMarshall(), NdrClientContextUnmarshall(), NdrClientInitializeNew(), NdrComplexArrayMarshall(), NdrComplexStructMarshall(), NdrContextHandleInitialize(), NdrContextHandleUnmarshall(), NdrFreeBuffer(), NdrGetBuffer(), NdrGetUserMarshalInfo(), NdrInterfacePointerMarshall(), NdrInterfacePointerUnmarshall(), NdrMesProcEncodeDecode(), NdrpCompleteAsyncClientCall(), NdrProxyFreeBuffer(), NdrProxyGetBuffer(), NdrProxySendReceive(), NdrSendReceive(), NdrServerContextMarshall(), NdrServerContextNewMarshall(), NdrServerContextNewUnmarshall(), NdrServerContextUnmarshall(), NdrServerInitializeNew(), NdrStubGetBuffer(), safe_buffer_increment(), safe_copy_to_buffer(), test_client_init(), test_conf_complex_array(), test_conf_complex_struct(), test_conformant_array(), test_conformant_string(), test_iface_ptr(), test_marshal_VARIANT(), test_ndr_simple_type(), test_NdrGetUserMarshalInfo(), test_nonconformant_string(), test_nontrivial_pointer_types(), test_pointer_marshal(), test_server_init(), test_simple_struct_marshal(), test_struct_align(), union_arm_marshall(), UserMarshalCB(), WriteConformance(), and WriteVariance(). Definition at line 251 of file rpcndr.h. Definition at line 229 of file rpcndr.h. Definition at line 255 of file rpcndr.h. Definition at line 257 of file rpcndr.h. Definition at line 256 of file rpcndr.h. Definition at line 226 of file rpcndr.h. Referenced by client_do_args(), client_free_handle(), client_get_handle(), ComputeConformanceOrVariance(), ndr_async_client_call(), ndr_client_call(), NdrClientInitializeNew(), NdrMesProcEncodeDecode(), NdrpCompleteAsyncClientCall(), NdrServerInitializeNew(), NdrStubCall2(), and stub_do_args(). Definition at line 230 of file rpcndr.h. Referenced by call_buffer_sizer(), call_freer(), call_marshaller(), call_unmarshaller(), client_do_args(), client_free_handle(), client_get_handle(), ComputeConformanceOrVariance(), convert_old_args(), mes_proc_header_marshal(), mes_proc_header_unmarshal(), NdrClientInitializeNew(), NdrContextHandleInitialize(), NdrContextHandleMarshall(), NdrMesProcEncodeDecode(), NdrServerContextNewMarshall(), NdrServerContextNewUnmarshall(), NdrServerInitializeNew(), NdrUserMarshalBufferSize(), NdrUserMarshalFree(), NdrUserMarshalMarshall(), NdrUserMarshalUnmarshall(), stub_do_args(), test_common_stub_data(), and test_NdrGetUserMarshalInfo(). Definition at line 219 of file rpcndr.h. Definition at line 212 of file rpcndr.h. Definition at line 220 of file rpcndr.h. Definition at line 268 of file rpcndr.h. Definition at line 267 of file rpcndr.h.